The Fourth of July is right around the corner! The month of June literally flew by. But now it is time to figure out what you are gonna wear for the big festivities. Determining your red, white, and blue ensemble kind of depends on what you will be doing on the fourth. Will you be at a classy affair, sitting on the grass watching fireworks, or in and out of the pool all day? 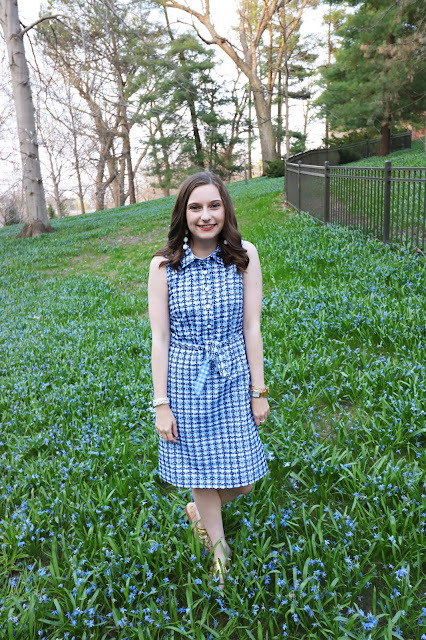 Well, I created three looks that are perfect for any activities you could be doing on the Fourth of July! There is a dressy, casual, and super casual look you can be inspired by. Dressy: Lets say you are going to a more fancy place for the fourth. Maybe you are going to a nice restaurant, out on a nice boat, I can't think of anything else but maybe you just want to dress up! Well, here is the outfit for you! (I am actually kind of obsessed with this outfit.) I paired a fun pair of navy pom pom shorts with a simple white scallop tank. To add a pop of red to the look I added a bold Baublebar necklace. I love the layered look that this necklace gives. For accessories I chose a bright red leather bag with a neutral espadrille. 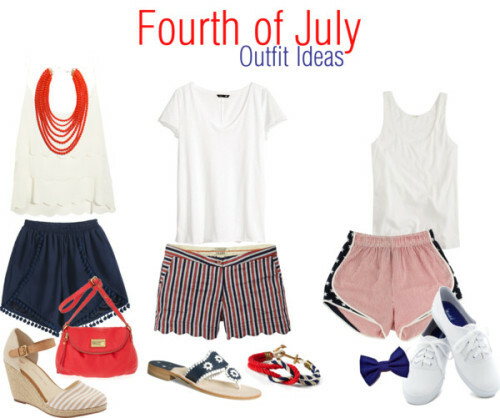 Altogether it creates a very chic, preppy, and girly Fourth of July look. Semi-Casual: I know for my Fourth of July I will probably be wondering around my friends town, watching fireworks, and other things of that nature. So, I want something comfy but also super cute. This would be my ideal look for the Fourth of July. I paired a fun pair of scalloped shorts with a simple white tee. Incorporating white into your outfit, I think, is super important! Mainly because you will be out in the hot sun and a white shirt will keep you cooler then a blue or red shirt. For shoes I paired them with these super fun Jack Rogers because they are my obsession. Then lastly I added a KJP red, white, and blue bracelet for an extra patriotic touch. Plus I am also obsessed with KJP. Casual: There are a lot of people who are probably going to be on the beach, at the pool, or on a lake for the Fourth of July. So, this outfit is perfect to just throw on over a bathing suit! I am loving these super cute American flag running shorts! These are a huge trend it feels like and I love them. I paired the shorts with just a plain white tank (you could do red or blue too!) then a pair of white Keds and then a simple blue hair bow. If you are going for a preppy casual look this is your ideal 4th of July outfit. Other red, white, and blue favorites! Shop Baublebar to get these super cute statement earrings! Shop Country Club Prep to get the hat, sunglass straps, and tank! Great post, I love all of the outfits but I need to go get those shorts!